Pierce Ranch Vineyards is a small, family-owned operation centered in southern Monterey County's San Antonio Valley appellation. Located in and around the Bradley-Lockwood area at the southernmost tip of Monterey County, the San Antonio Valley AVA is on the verge of adding an exciting, new facet to the wines of Monterey County. Newly designated as an official American Viticultural Area in June of 2007, the San Antonio Valley has lately undergone a long-deferred renaissance as growers and winemakers have come to rediscover the area’s suitability for growing robust, fully mature fruit. In the upper reaches of the Arroyo Seco River in Monterey County lies the unparalleled beauty and award-winning vines of Mesa del Sol Vineyards. This historical estate perched on a mesa overlooking the Arroyo Seco River and the Ventana Wilderness sets the stage for an exclusive and unforgettable retreat. While kissed by the marine influence of the Pacific Ocean, the Arroyo Seco Highlands regularly see summertime temperatures that reach into the 100's with cool nights that dip into the 50's. The air is dry and the soil is lean and rocky. The vineyard is nutrient poor sandy cobblestone, and the howling afternoon wind is legend. Several Italian clones – who knew there were Italian clones in California? —enjoy a long hang time here, resulting in a broad range of flavors. Due east over the coastal range from Steinbeck's Long Valley, and halfway down the highway built by Spanish Missionaries and adored by Hell's Angels, the Siletto family vineyards send roots deep into the calcarious soils of San Benito. These unique limestone soils and warm Mediterranean climate make a ideal site for growing Viognier, a grape traditionally grown in the northern Rhone river valley in southern France. Wine industry veteran Ron Siletto planted the vineyard in the late eighties, and continues to farm the vineyard sustainably today. The wines express a unique allspice character and a flinty minerality on the finish, lending a site specific expression from vintage to vintage. 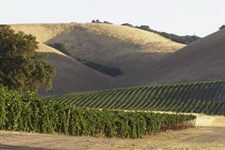 Four estate vineyards in the Santa Lucia Highlands comprise more than 10 percent of the total acreage planted in the AVA. All of our meticulously planted, hillside sites are situated at elevation and overlook the Salinas Valley. Their southeastern slopes assure plentiful morning sun. The setting of our vineyards is dramatic, with massive alluvial fans of decomposed, metamorphic rock curtaining in and out across the hillsides. These well-draining soils are one of the two main reasons for the intensity and complexity of our Pinot Noirs. The second is wind. As Salinas Valley heats up during the day, air rises and is replaced by the cool air over the deep and cold Monterey Bay, creating a wind tunnel. A 12 acre family vineyard property in the Sierra Foothills with 2200 foot elevation. Michael Pinette grows such beloved varietals as Cab Franc, Zinfandel and Sangiovese. Wine from this property has won gold and silver medals under several brands. We love to work with local winemakers to deliver fantastic fruit. The Graziano family is one of the oldest grape growing families in Mendocino County. These vineyards contain original plantings by Vincenzo Graziano of Carignane and Moscato. Newer plantings of Zinfandel and Charbono grace these unique white Pinole clay loam soils. To carry on this tradition of grape growing, Greg and his wife Trudi have planted two small vineyards. Overlooking the Cachagua region of Carmel Valley, (“Cachagua” is believed to be an Indian derivative of the French “cacher” and the Spanish “agua” – “hidden waters”), and framed by the dramatic surrounding hills, lie the beautiful vineyards of Massa Estate, formerly Heller Estate. The vineyards are planted with Cabernet Sauvignon, Merlot, Cabernet Franc, Chardonnay, Chenin Blanc, Pinot Noir, Petite Sirah, Malbec and Petit Verdot at an altitude of 1200 – 1500 feet. The tiny Santa Lucia Highlands AVA spans 22,000 acres, with only 6,400 planted to grapevines on the sloping eastern-facing mountain hillsides from 40-2,330 feet of elevation. Pinot Noir predominates with 3500+ acres under vine, but Chardonnay is also well represented with more than 2200 acres planted. These cool-climate varietals thrive in the brisk maritime air and produce exceptionally powerful, elegant wines. More than 50 vineyard properties are owned by dedicated viticulturists who grow grapes for vintners across California and produce wines under their own labels. Our region’s long history of farming means that sustainability and innovation have always been a priority. Here, our winegrowers embrace both technology and sustainability, viewing innovation as a means to improve wine quality and the ecosystem together. Zabala is one of Monterey County’s oldest vineyards. We have harvested fine wine grapes for over forty years, and our limited annual production is award winning. Zabala Vineyards is bounded by the Santa Lucia bench and the Arroyo Seco River in the center of Monterey County. Distinctly rocky solids and coastal breezes influence our premium grapes, and have helped make the Arroyo Seco AVA one of the most sought-after appellations in California.